Seoul’s original typeface, the Seoul Typeface, was developed to enhance Seoul’s brand value. Based on the Myeongjo Font (Korean serif type), the type family includes four Seoul Hangang fonts (light, medium, bold, and extra bold), four san-serif Seoul Namsan fonts (light, medium, bold, and extra bold), and one font for vertical writing, making nine fonts in total. 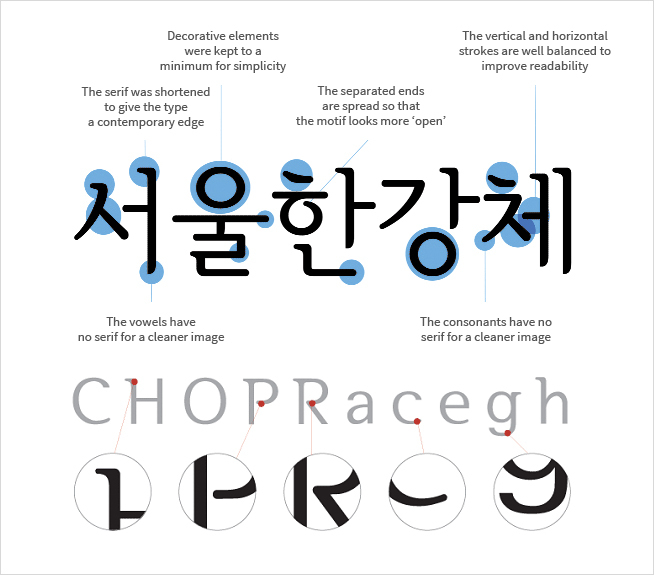 The Seoul Typeface was inspired by the spirit of the nation’s classical scholars. It's simple yet elegant features make good use of empty space and capture the elegant curves of the Hanok, or traditional Korean houses. The name incorporates Hangang and Namsan, two of Seoul’s most important assets. 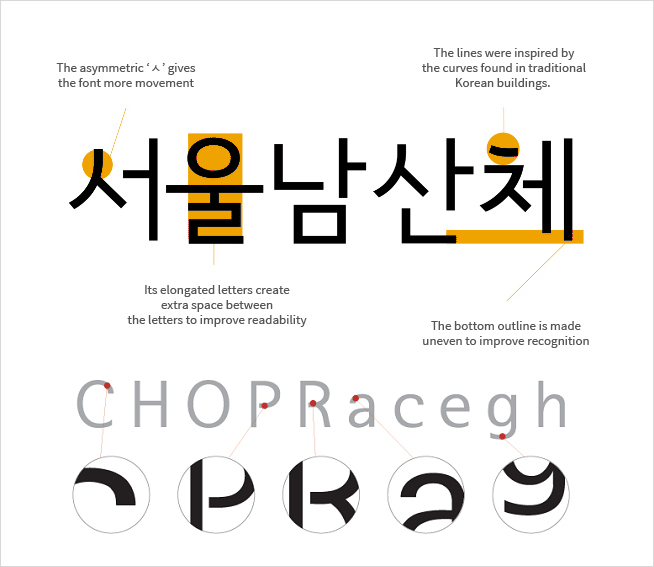 The typeface is intended to foster cultural pride in both written and spoken Korean. The serif was shortened to give the font a contemporary edge. Decorative elements were kept to a minimum for simplicity. The vertical and horizontal strokes are well balanced to improve readability. The vowels have no serif for a cleaner image. Projections were removed to create a cool space. The consonants have no serif for a cleaner image. The asymmetric “ㅅ” gives the font more movement. Its elongated letters create extra space between the letters to improve readability. The space between the letters and characters create enhanced spatial beauty. The lines were inspired by the curves of traditional Korean buildings. The bottom outline was made uneven to improve recognition. Seoul Type is available to download for free. Everyone is welcome to utilize the Type on multimedia channels, publications, web, and mobile formats without seeking permission. Note that distributing Seoul Type in exchange for money or any other commercial acts is prohibited. Seoul Type is a unique typeface developed for Seoul and is widely used to emphasize Seoul’s identity and elevate it's brand value. Seoul Type was inspired by the unwavering spirit of classical scholars and the beauty of simplicity. The structure was designed to resemble the gradual curves of a traditional hanok roof.